Mississippi Export Railroad is a 42-mile short line railroad extending from George County to Gulf of Mexico. It’s the north-south corridor connecting the Canadian National Railroad and the east-west line of CSX Transportation. MSE also connects to the Norfolk Southern and Kansas City Southern through haulage agreements. 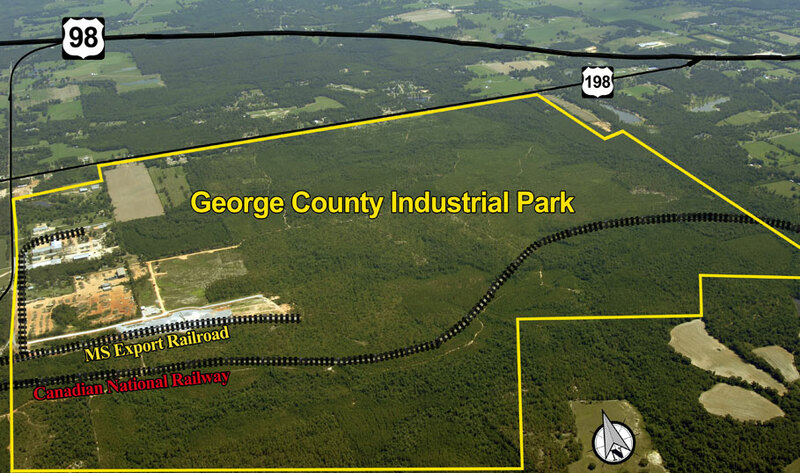 GC Industrial Park directly connects with MS Export Railroad with two rail spurs inside the Park. The Canadian National Railway also runs directly through the Industrial Park. The Port of Pascagoula, located on the southeastern coast of Mississippi is a full-service deep water port. The Port’s two harbors include a combination of public and private terminals handling in excess of 35 million tons of cargo. The Port is the largest seaport in Mississippi. The Alabama State Port Authority owns and operates the State of Alabama’s public, deep-water port facilities at the Port of Mobile. The Authority’s container, general cargo and bulk facilities have immediate access to two interstate systems, five Class 1 railroads, and nearly 15,000 miles of inland waterway connections. GC Industrial Park is 40 miles southeast from the Port of Mobile and directly connected by the Canadian National Rail and the Federal Highway 98. ASD Warehouse and Open Yards: 4 Million sq. ft.
- Substations transferred via 220kV lines.